The Textbook of Psychiatry has evolved over a number of years: initially from student notes, later as an informal collection of chapters which became the First Edition of a fully-fledged textbook in 2001, the Second Edition in 2005, the Third Edition in 2014 which was a major revision to incorporate changes in DSM diagnostic nomenclature (namely, the DSM-5), and now the Fourth Edition. 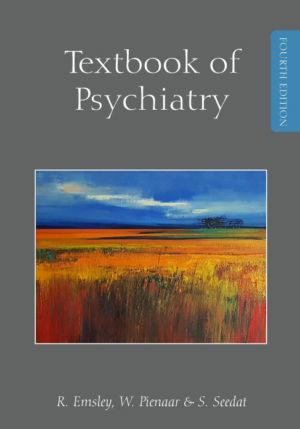 The textbook was originally written to address the need for an undergraduate textbook in psychiatry that is relevant to psychiatric practice in South Africa. This is necessary because, while psychiatric disorders occur throughout the world some occur more commonly in our country, or have a greater impact on the disease burden locally. Also, while treatments are similar internationally, the availability of treatments (both biological and psychosocial treatments) may differ. Finally, legislation regarding mental health care is country-specific and ethical considerations are context-dependent. The Fourth Edition of the textbook has been revised to keep abreast of new developments in the field, providing updated information according to the current evidence base. Each chapter has been extracted from the enormous amount of literature that is available on these topics. The authors have combined their knowledge of the literature together with their own clinical experience, presenting in each chapter a concise overview of the most important aspects of the topic, with a particular emphasis on a practical approach to understanding and managing patients with psychiatric disorders. The topics in this book are presented from a bio-psychosocial perspective. In this way, full recognition is given to the inseparable interaction between medical/physical, psychological and social factors in the development, course and management of psychiatric disorders. To order, please contact us at mhic@sun.ac.za or tel 021 9389229.